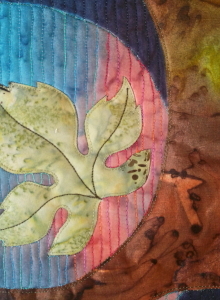 August Challenge Week 5 » What's Under the Needle? My last word and last week of August for this challenge! The word I have yet to use is 'vertical'. I've been thinking about that and an easy solution would be to hang the entire piece in a vertical position or in other words, portrait style. However, I don't think that is really enough to portray the word so instead, I may take up my thoughts from week one and enhance the blue silk fabric to have a bit more of a liquid feel - I'm thinking of creating a waterfall effect in the background. 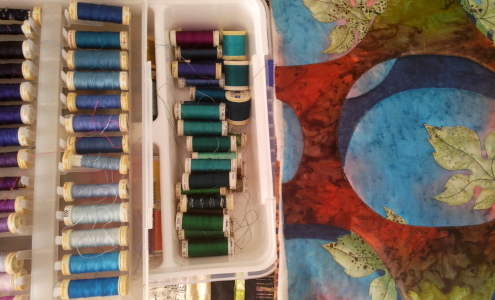 Pulling threads from my thread stash is just as much fun as finding the right fabrics! 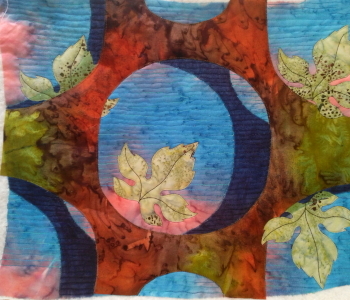 I started with only the blue areas - I realized that the photo can help make the right choices but it is always good to remember that often it is important to include a little contrast in shades as well as matching them. 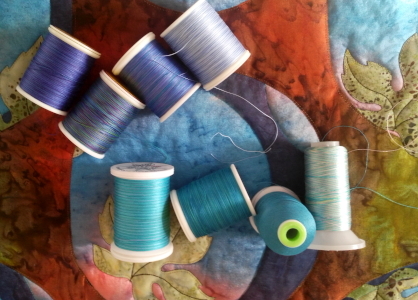 These variegated threads look like fun to work with! 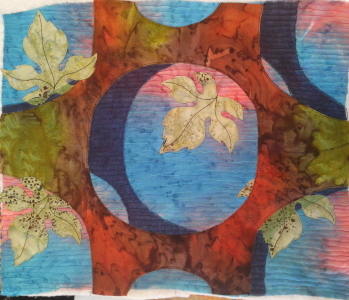 This is the one I decided to use for the blue areas with a plain navy for the areas in the shadows. 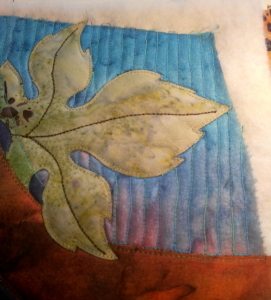 As I was stitching, I noticed how the silk had pulled in a little at the top - something to be aware of before stitching begins as it is way too late to try correcting that now. I'll trim it square at the end. 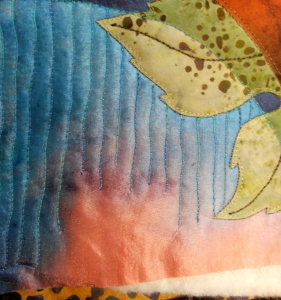 I stitched vertical lines and in some places made little bumps like water dribbles. 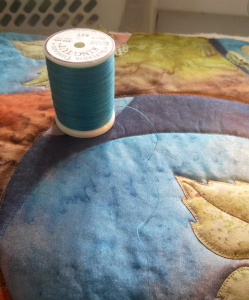 I stopped at the orange sections as I plan to use orange thread there. 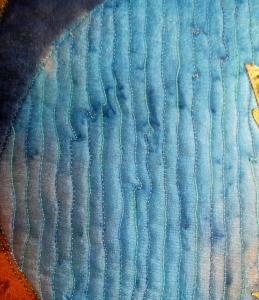 Here's how it looks with all the blue area stitched including the darker thread in the shadow sections. It was interesting trying to find the right thread for the orange area. 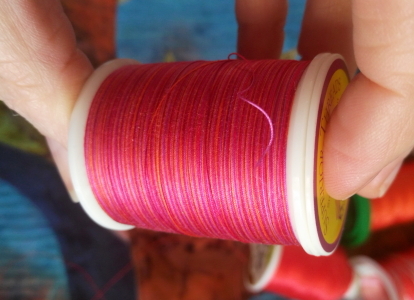 It is more of a red/orange color but when I pulled my threads out, I could see the salmon pink (at the bottom of the photo) was much closer in color than the other threads I had. 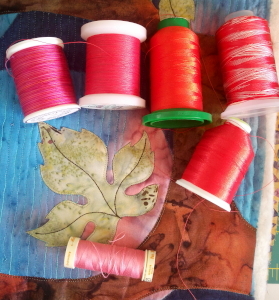 The thread I finally decided on was a variegated red, orange and pink thread. Colors I would not normally put together but I thought now is an opportunity to try. It turned out better than I'd hoped for! 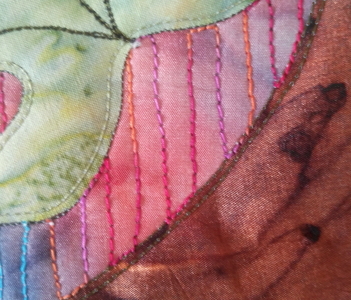 In the close-up, you can see how I connected the lines of stitching. I worked on to finish all the stitching so here is how it looks. Of course, I'll have to turn it upright for the lines to be vertical! Now all I need to do is finish it off... I could add some beads... and I'm not sure what kind of binding I'll use yet. Let me think on that and I'll get back to you.